I have recently returned from a trip to Cyprus, the newest destination on offer from Golfbreaks.ie. As we get many requests from groups looking to travel to new destinations we thought this would be a perfect fit. Cyprus has a fantastic climate throughout the year, combined with some great golf courses and it’s rich culture it makes an ideal destination for a golf break. As Cyprus is becoming an increasingly sought after destination for holiday makers and golfers alike the airlines are beginning to increase the number of flights into this Mediterranean Island. I departed Dublin airport at 12.55pm on Wednesday afternoon and after a direct flight of 4 hours 20 minutes with Cobalt Air I arrived in Larnaka airport. Cobalt currently have an offer for golfers to bring their golf clubs free of charge which is a big bonus as this helps keep the cost down. I would be staying at the luxurious 5* Aphrodite Hills Golf Resort during my trip and after a 45 minute transfer from Larnaka I had arrived. Aphrodite Hills is the only golf resort in Cyprus. It has been developed over the past 10 years. The resort is located in the hills above Paphos and offers guests a choice of accommodation in either the 5* hotel or the residence apartments and Villas in the resort. For couples or smaller groups of golfers I would suggest staying in the hotel, the modern rooms all feature a private balcony or terrace overlooking the sea, carefully maintained gardens or the championship golf course. Over the next 3 days I had a very intense schedule which consisted of plenty of golf, some hotel visits and plenty of opportunities to try the local Cyprian cuisine which I was really looking forward to. After a delicious breakfast in the hotel it was just a quick 2 minute walk to the Aphrodite Hills golf course to meet my playing partners for the week. We had time for some practice on the well equipped practice facilities the resort has on offer, this got us well warmed up for our round of golf ahead. The PGA National golf course in Aphrodite Hills has recently undergone a €2.5 million renovation to the greens and bunkers and they have done an unbelievable job. This course is a fair challenge for all level of golfers who play it. The undulating fairways and greens covered in Bermuda grass as well as the water hazards, tactically placed bunkers and deep gorges add to both the enjoyment and challenge of this spectacular golf course. Considering it was early February when I played the course I was very impressed with the condition they had kept it during the winter period, which to be fair in Cyprus usually doesn’t drop below 14 degrees. After an enjoyable round of golf we headed back to the hotel’s restaurant for dinner. The buffet style meal they had on offer had a variety of food to suit everyone’s taste. An early start on Friday morning began with a transfer to Minthis Hills golf club. This picturesque golf course is located in the mountains which ensures some spectacular views and challenging winds which thankfully being a member of Howth golf club I was well used to. The very modern clubhouse overlooks this great holiday golf course which requires accuracy from the tees and a sharp short game in order to score well. This course features some great signature holes, such as the par 3 13th. The island green surrounded by water gives you a great sense of satisfaction if you manage to land the ball on it. 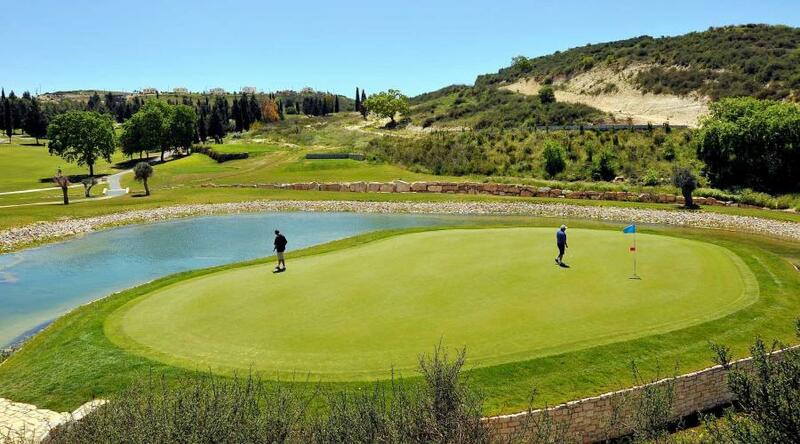 This varied golf course with no two holes the same is a must play when staying in the region. After our lunch we departed to the second course of the day, Elea golf club. Elea golf club is a classic Faldo designed golf course due to the large number of bunkers positioned around the fairways and greens. This links style course blends well into the surrounding landscape and was by far the most challenging course of the week. The strategically placed hazards and the oddly shaped bunkers are sure to catch any arrant shots, so accuracy is key around this golf course. Regarded as the top course in Cyprus by many it is not hard to see why and I would highly recommend it if you are looking for a good challenge. As we arrived back in Aphrodite Hills Resort we had little time to relax as we were heading out for a dinner in a traditional Cyprian restaurant in the city of Paphos. If you ever get the chance to travel to Cyprus it is a necessity that you try a ‘Meze’ style meal. We sat down for a dinner at 7.00pm and at 9.00pm the waitress was still delivering different dishes to the table. I have never had such a variety of food in my life! This is a custom that I wish was more readily available in Ireland and I am looking forward to trying it again. Saturday had arrived an it was the last day of the trip. We traveled to Secret Valley golf club which was just 10 minutes drive from Aphrodite Hills Resort where we were staying. The 18 hole golf course is carefully laid out in the lower part of the valley where it utilizes it’s steep hillside terrain for some elevated tee shots towards the undulating fairways. 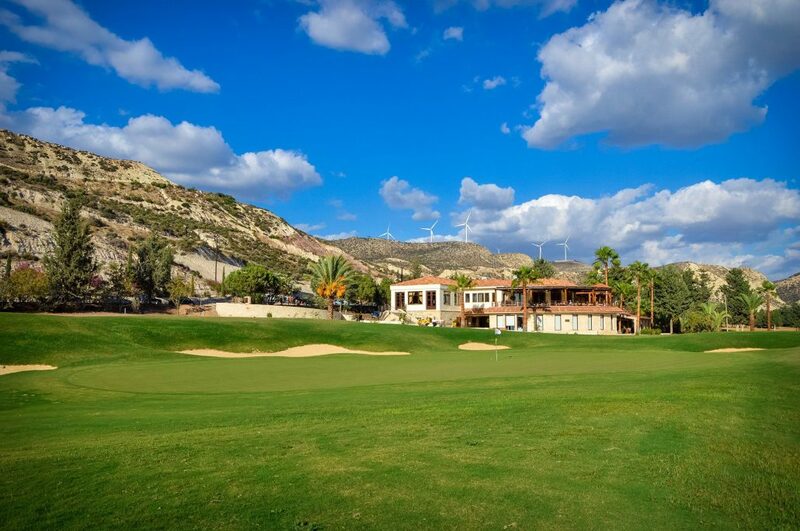 The sheer play ability of this course along with the friendly atmosphere, it is no surprise that secret valley is such a popular choice for golfers when they visit Cyprus. As I had an early flight back to Dublin the following morning I headed back to the hotel to try out some of the great facilities on offer such as the indoor swimming pool, steam room, sauna and gym. This was a nice way to end a very enjoyable few days. As I wrap this blog up I hope it has given you some insight into what Cyprus has to offer and that you can keep it in mind when planning your next golf holiday. If you would like any more information on booking a golf break in Cyprus, be sure to get in contact with us. Along with our expertise we always have great offers available throughout the year. Thank you for reading & be sure to contact Golfbreaks.ie for your next golfing trip.